Since 1994 Mr. Kevin Coleman, known simply as Mr. Coleman, has been making a name for himself within the fashion industry. After 24 years of production, 10 years of mentoring, and 6 years of producing Fashion Week, Mr. Coleman has now generated the most anticipated non profit organization. 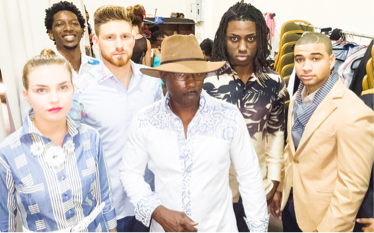 Mr. Coleman is one of the fashion show producers in South Florida known better for Funkshion which is a four day event in fashion week that is held three times each year on South Beach. Mr. Coleman has produced and consulted several films. Here, Mr. Coleman is seen behind the scenes with actress Claudia Jordon on the set of "Stalker the movie"
Mr. Coleman, the producer of Ay Mami TV, and co-producer of several TV programs is seen here behind the scenes of Funkshion Fashion Week.